Sophomore forward Javier Langarica dunks the ball during Sunday's game against Duquesne. The Colonials lost to the Dukes in overtime 91–85. 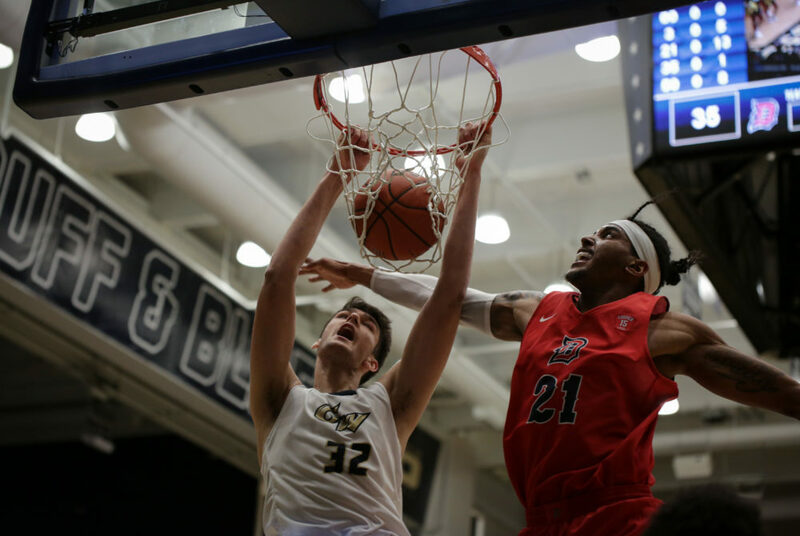 Duquesne was projected to blow out GW on its home court Sunday, and the Colonials’ overtime loss certainly started out that way. The Dukes (13-5, 4-1 A-10), one of the three highest scoring offenses in the Atlantic 10, sped out to a 24–6 lead in the opening seven minutes of play while the Colonials (6-12, 2-3 A-10), one of the conference’s two lowest scoring teams, went 2-for-10 from the field in the same span. But the Colonials battled midway through the first half and went into halftime riding the momentum of a buzzer-beating jump shot that put them within six points of the lead. GW continued chipping away at Duquesne and eventually took the lead, but the Dukes sent the game into overtime where they ultimately won 91–85. The Colonials were led by sophomore forward Javier Langarica’s career-high 19-point effort. Langarica went 7-for-14 from the field and collected 10 rebounds in the effort. Sophomore guard Justin Mazzulla picked up 16 points while dishing out a team-high eight assists and five Colonials ended the night in double-digit scoring. “I thought we battled our tails off and just fell short,” Joseph said. The Dukes’ opening run was fueled by sophomore center Michael Hughes’ play on the block. Hughes had 11 points on 5-for-6 shooting in the opening four minutes of play and led the floor with 21 points, 14 rebounds and seven blocks on the night. The looks were there for GW in the opening minutes of the game but the shots were not falling, until back-to-back threes from Langarica and sophomore guard Maceo Jack – who picked up all 15 of his points from beyond the arc – made the score 26–12 with 11:15 left in the first half. A three-point shot from redshirt junior guard Armel Potter cut the Dukes’ lead to five points 30–25 with 5:45 left before halftime, but Duquesne responded with an 8-2 run to keep the Colonials at bay. The Dukes pulled ahead by as many as 11 points in the final six minutes of play before Langarica collected a missed three-point shot by redshirt junior guard DJ Williams and sank the jumper to beat the buzzer heading into halftime with Duquesne up 45–36. After opening the game 1-for-5 from the field and 0-for-4 from the three-point line, the Colonials went into the locker room shooting 48.4 percent from the field on a 15-for-31 clip. The Dukes were keeping pace, going 16-for-34 from the floor in the same span. Langarica led the floor with 17 points on 7-for-10 shooting at the half and led GW with four rebounds. GW carried its first-half momentum into the second frame, where the Colonials outscored Duquesne 38–32. The Colonials opened second-half play with a quick three points to get within three of the Dukes but Duquesne picked up five unanswered points to keep the lead 50–42 with 17:10 left in the game. Duquesne continued to keep the game out of GW’s reach until the Colonials’ defense started getting stops with about eight minutes left in the frame, capitalizing on two Duquesne turnovers to pull within one of the lead. 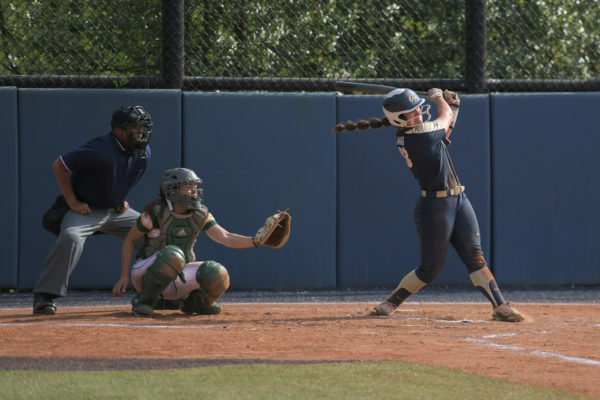 “We got a lot of energy stemming from stops and stemming from each other,” Mazzulla said. Potter – who turned in 14 points and five assists off the bench – knotted the score 69–69 with less than five minutes to play in the game after completing an and-1. The Colonials collected their first lead of the night 74–71 with 1:37 left to play in regulation when Jack drained his second three-point shot of the game. A pair of made free throws from Duquesne gave GW the ball back, but the Colonials had trouble with Duquesne’s full-court press on the inbound, which plagued the Colonials earlier in the game. Williams couldn’t break a double team in the back court and threw the ball to Duquesne. The Dukes got the ball to Hughes under the net, who buried a layup to deflate GW’s lead to one point 76-75 with 33.5 seconds left to play. Hughes muscled his way into the paint again and picked up the game-tying layup with five seconds to play. “The lapses that we had were a little bit more mental than they were physical,” Joseph said. Duquesne opened with an 8-0 run in the extra frame while holding GW to 0-for-7 shooting in the same span. Hughes mustered four blocks on the post and did the most to shut out the Colonials from the paint. Duquesne outscored GW 14–8 in the overtime to take the win.